Please refer to our stock # SR1411 when inquiring. 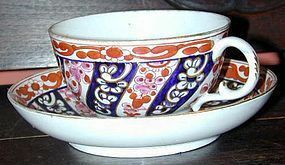 This is a Worcester soft paste porcelain tea bowl and saucer, in the the well known Worcester pattern "sworl" or "Queen Charlotte", named for Queen Charlotte, wife of George 111 who bought a service for royal use. Ours is marked with the "scratch B" mark of the Flight and Barr period, c 1795. Priced at $ 1200.